The Oconto Falls Area Schools are Committed to Excellence! We are proud of the accomplishments of our students, teachers, and other staff members who work with the young people coming through our school house doors. Our goal is to provide a high quality, comprehensive education for all students and to continue to be a vital contributing force in our communities. We are proud of the accomplishments of our students and the great teachers and other staff members who work with the young people coming through our schoolhouse doors. We extend that welcome to visitors, not only to tour the website but to come into our buildings for the many activities open to the public. Our goal is to provide a high-quality comprehensive education for all of our students and to continue to be a vital contributing force in our communities here in Northeastern Wisconsin. 2018 National Gold Council of Excellence! The Student Council has just been recognized as a 2018 National Gold Council of Excellence. Earning the award was no small task and our students’ success is a testament to the leadership and support that Kristin and Kelli give to them as their advisers, and to the value placed on student council as an integral part of our school district. 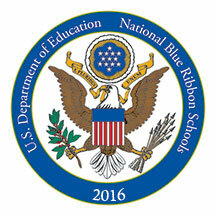 Oconto Falls Elementary School has been recognized as a National Blue Ribbon School for 2016 by the U.S. Department of Education. Our school is one of just eight in Wisconsin to be recognized for making notable improvements in closing achievement gaps among student groups.